This book was pretty good. I really enjoyed it, but it never thrilled me. I think that sums it up. I liked the characters. I liked the writing style, I just wish it hadn't been so easy for the good guys to win. Now they had to do a lot of hard stressful work to achieve their goals, and they could have been in very dire danger many times, but they just didn't quite have the all is lost moment. It felt like it was coming for a long time, and then the book was over. Okay, before I get to things that bothered me about the book let me list things I liked because this was a fun book to read and there's a lot to like. The slow build of this book was pretty great. You learn about the firm and why it's a creepy bad place to be employed in little pieces bit by bit throughout the book. This was well executed. Also the characters came across as real people. They were fleshed out just enough. 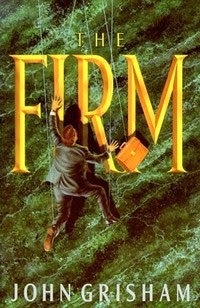 The firm as a setting was a character all it's own. Much like a character should grow and change the firm changes for you as a reader. Now it doesn't actually change, but your perception of it does as you work your way through the story. You know from page one that it's not a great place to work, but you experience the lure of it through the eyes of the protagonist and so it seems like a great and exciting place to work at first. A place of tremendous opportunity. Then as you fly through the chapters and its secrets are revealed you discover what kind of a place it really is. Although I do remember a few beautiful sentences here and there describing movements of the weather and other things - John Grisham's writing style was refreshingly plain but in a good way. It didn't get in the way of the story. The words just fly by as the story unfolds. This is no small task to write in this way. His writing has an easy way about it. I will definitely be reading more of his books in the future because if he could write this well early in his career, I can't wait to see how well he can write with dozens of titles under his belt. One funny thing that surprised me while reading this book is that it inspired me to work harder on everything in life. You read about the main character putting in insane hours at the office and you think, if he can do this I can work extremely hard too. I always try and work hard at everything I do, but reading this novel seemed to give me a little boost in that department. It also made me thankful for my nine to five job and that I'm not a lawyer. I like seeing my family. The main character was too confident. I think this may be a part of what made it seem like everything was always okay and that no danger would befall the characters. Now Grisham sets up a fantastically scary atmosphere for the characters to live in. It would be terrifying. But the protagonist was so confident the whole way through that I just figured he would be fine since he wasn't really too worried about it. Maybe this was due to the fact that he kept having to convince his wife that everything would be alright. It kind of got to me the way that he spoke unabashedly to the F.B.I. agents like he was in charge. I guess it could be argued that this is what makes him such an awesome hero. What did you think of The Firm? Have you read it? 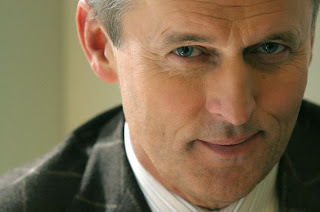 Any other novels by John Grisham? I've been calling him "Grishams" because of this funny Key & Peele skit. Do you have any recommendations for John Grisham books? I'd love to hear them. Thanks for stopping by. I listened to the audiobook which was brilliantly narrated by one of my favorites Scott Brick.